Lisburn Distillery Youth stayed top of the under-16 section of the Lisburn Junior Invitational League following a 1-1 draw with their main rivals, Downpatrick Youth. UNDER-13:Ballymena 3, N. End 5; Carrick 0, Lurgan 1; Greenisland 1, Hillsborough 4; Chimney 1, Lisburn Dist 1; Willowbank 2, TW Braga 6; Windmill 2, TTBS 1. UNDER-14: Armagh 1, Downpatrick 6; Bloomfield 5, Lurgan 1; Portadown 6, Warrenpoint 2; Lisburn Y 2, N. End 1; Hillsborough 0, Lisburn Dist 1; Shankill 1, Ox Sunnyside 0; Windmill 2, Ox Sunnyside Colts 1. UNDER-15: Ballyclare 0, Carrick 1; Donegal Celtic 2, Windmill 2; Greenisland 0, Hillsborough 1; Lisburn Y 1, N. End 0; Lisburn Dist 5, Ox Sunnyside 1. UNDER-16: Greenisland 0, Lisburn Rgs 1; Hillsborough 1, Midway 3; Lisburn Dist 1, Downpatrick1 1; Lurgan 4, N. Belfast 2; Willowbank 4, Ridgeway 3. UNDER-17: Banbridge 1, Lurgan 1; Carrick 3,Willowbank 3; Bloomfield 1, Lower Maze 0; Lisburn Dist 5, Newry 0; Hillsborough 0, Dromara 2. BARBOUR: 9.30, Hillsborough v Windmill u13, Windmill v Lisburn Y u15, Bloomfield v Newry u17; 11.15, Lisburn Rgs v Lisburn Y u13, Warrenpoint v Bloomfield u14, Portadown v Shankill u14. GLENMORE: 9.30, Ballymena v Carrick u13, Lurgan v Lisburn Rgs u16; 11.15, TTBS v Lisburn Dist u13, Greenisland v Ox Sunnyside u15. MOIRA: 9.30, Lurgan v TW Braga u13, Ox Sunnyside v Windmill u14; 11.15, Lisburn Dist v Lurgan u14, Ox Sunnyside Colts v Armagh u14. WALLACE PARK: 9.30, Donegal Celtic v Ballyclare u15, Hillsborough v Lisburn Dist u15, Hillsborough v Downpatrick u16; 11.15, N. End v Greenisland u13, Downpatrick v N. End u14, Midway v Lisburn Dist u16. BALLYMACOSS: 9.30, Carrick v Newry u15, Dromara v Lurgan u17, Lisburn Dist v Lower Maze u17; 11.15, Chimney Corner v Willowbank u13, Willowbank v Banbridge u16, u17. FULLERTON PARK: 9.30, Lisburn Y v Hillsborough u14; 11.15, Hillsborough v Carrick u17. ORANGEFIELD: 9.00, N. Belfast v Greenisland u16. Braniel YM are still in the hunt for the Premier Division following a 5-1 win over Sandy Row. Scorers were Allan Moore, Adam Hamilton; Lewis Irwin and Samuel Patterson 2. Glaston were 4-2 winners over Warren YM with Jim Mallon hitting a hat-trick and Davy Hall getting the other one. David Irwin and Colin Chapman replied. 1st Lisburn beat South Antrim 3-1 with goals from Richard Hunter penalty, Ben McMaster and an own goal. Stephen McNeice replied. Cregagh Wanderers caused an upset in Division 1 with a 2-1 win over Bloomfield III, thanks to goals from Michael Norris and Andrew Topley. Ballymacash Rangers III won 4-1 against Ballymacash YM III in Division 2. Stuart Greer got the Young Men’s goal and Rangers replied through Jordan Frazer, Gareth Sherwood, Andy Robinson and Lee Gourley. Lambeg Rangers II and Clonduff YM III fought out a 2-2 draw with Nicky Shields and Ryan Nixon scoring for Lambeg. 1st Lisburn II came back from 0-2 down early on to beat South Antrim II 3-2. Gareth Johnston and Chris McPoland gave South the advantage, but Luke Chambers 2 and a Ryan Patterson header won it for 1st. Glenavy III had a 5-2 win over Newtown Forest III. Ballymacash YM beat Clonduff YM 3-0 in Group B of the Supplementary Cup, thanks to goals from Jordan Johnston 2 and Jimmy Bushe. In Group A of the Supplementary Plate Braniel YM II beat Colin Valley III 4-2 with Hall and Murphy getting the losers’ goals. FC Utd Lisburn II beat Clonduff YM II 6-1. Liam Morrison scored for Clonduff and Steven Matthews 3, Willy Kenny, Davy Dowling and Gareth Oldroyd got the FC goals. Stephen Tierney got eight of the goals in the 10-0 win for Ballymacash YM II over Belvoir FC II in the Plate. He has scored 43 goals for the club. Colin Jamison and and Matthew GRaham got the other goals. Victoria Athletic and Orangefield OB III drew 3-3. Belvoir FC player, Mark Andrews, suffered a broken ankle in two places in the South Antrim League Supplementary Cup match with FC Utd Lisburn on Saturday. The South Antrim League wish to express their sincere good wishes to Mark and along with FC Lisburn wish him a speedy recovery. Lisburn Rangers Youth earned a place in the semi finals off the NIBFA Cup with a 5-2 victory over Ballinamallard. It was a great display by the Lisburn club and a wonderful achievement to reach the last four of N. Irelands biggest cup tournament. The second half was a more tense affair for both teams with the knowledge the next goal could determine the game. 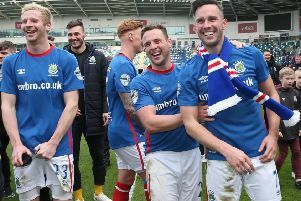 The breakthrough came after 20 minutes when Rangers passed their way through Ballinamallard’s defence with Thomas Burns finishing the move off to complete his hatrick. With the pressure off, Lisburn were relaxed and passing the ball with ease, Ballinamallard knew there was no coming back in this game. The final goal came when Kurtis Gillespie was played in and with pace found himself one on one with the keeper, the game finished 2-5. A great result with a fantastic performance, with this work rate and an abundance of team spirit this group off lads are punching above their weight and enjoying it.